Apartment Gaby has one bedroom on the third floor of a small building of four floors and it can accommodate two people in great comfort. From the balcony equipped with table and chairs, you will have amazing sea view. The sea is only 100 metres away. 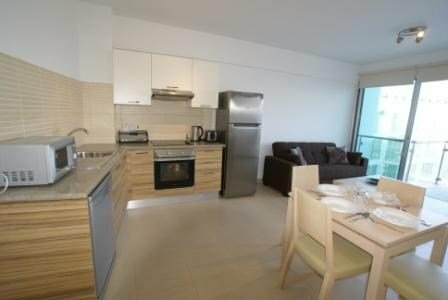 The apartment is located in Protaras, only a seven minutes walk to famous Fig Tree Bay and all amenities, and ten minutes drive to Ayia Napa. There is 5 miles of promenade for holiday makers nearby. Apartment Gaby will make your stay an unforgettable experience. The famous Fig Tree Bay is just a short walk away, and there are a few smaller beaches nearby as well. Excellent bars and restaurants are within walking distance too. The complex boasts tennis court, 2 outdoor pools, and baby pool that can be used free of charge. One bedroom apartment with a comfortable double bed with bedside cabinets, dinning table for 4, balcony with sea view, and outdoor furniture.